I knew that trying to tackle each item on our menu would be a tough job (our Swedish Christmas Eve dinner was really gluten heavy. My Swedish ancestors were apparently a carb loving bunch), so I decided to make it easy on myself. I planned a nice simple meal, but worked on changing the one recipe (potato pudding that year) that mattered to our family the most for it to feel like Christmas. Each year since that first, I worked on just one recipe a year. Each year just the one until it was perfected, then I’ll work on another one. It has been quite a bit of time since that first gluten free Christmas (12 years now), so our meal is a no brainer now. The flavors of my grandmother introduced to me that now mean Christmas to me are also are the ones my kids think of when Christmas is here, thanks to a little experimenting and a lot of trial and error. 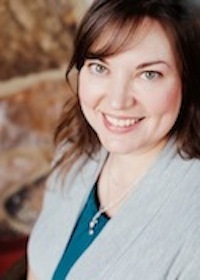 Food traditions don’t have to end simply because of food allergies or due to celiac, but you may need to redefine how those look for your family and look creatively at ingredients you may not have used before. 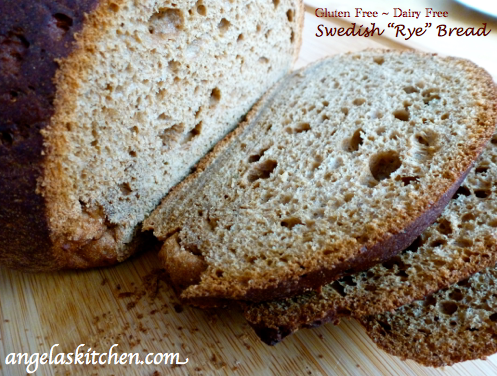 Gluten Free Dairy Free Swedish “Rye” Bread is one of those recipes for my family. Swedish Rye Bread IS Christmas for us. The recipe is similar to a traditional Swedish Limpa bread, slightly sweet from molasses and brown sugar, perfumed with anise, fennel, cumin and a bit of orange. I couldn’t wait for this bread as a child, waiting so impatiently for warm thick slices to nibble on. Grinding the spices was always the best part when I was little. We used a small mortar and pestle that I was fascinated with – now my own kids grind the spices when Christmas rolls around. Of course, Swedish “Rye” Bread is delicious anytime of year, equally at home as a breakfast with a bit of almond butter and cinnamon sugar or as the bread in a ham sandwich. You can bake the bread in a bread pan, but I usually shape the dough in a ball and bake in a cake tin for a round loaf because that is what grammy did. 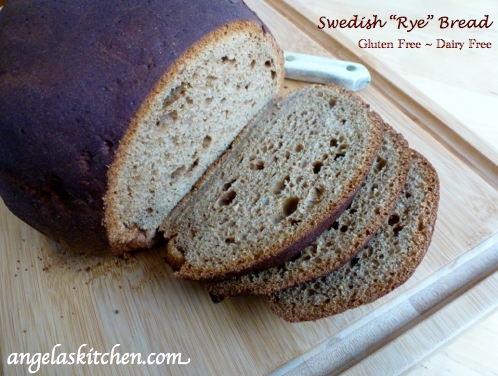 Try this gluten free take on Swedish Rye Bread when you would like something a little different for a yeasted bread. As for me? I still like slicing a thick piece to have with my tea. I think my grandma would approve. In a non-reactive bowl, combine ¾ cup milk substitute, garbanzo flour, sorghum flour, yeast, molasses, and cider vinegar. Mix well. Cover bowl and set aside for 2 to 4 hours. In the mixing bowl of a heavy-duty mixer, beat eggs until frothy. Add oil, blend. Add garbanzo flour mixture and stir well. Wisk dry ingredients together in a separate bowl. Add dry ingredients, mix well on low speed until all ingredients are incorporated. Check texture of dough. If needed, add 1 Tablespoon of milk substitute at a time until the correct texture is achieved (not too stiff, not soupy – thick and sticky). Beat at high speed for 3 minutes. Scoop dough into an oiled 8 inch x 4 inch bread pan. Smooth dough with oiled hands. Our family likes this bread baked in a round cake or pie pan because my grandmother always made round loaves at Christmas time. Bake in a preheated 375 degree oven for 50-60 minutes. If the crust is browning too much for your taste, set a piece of foil over the top of the loaf during last half of baking time. One more tip for all gluten free bread baking: If you take some ice and put it on an old baking pan you don’t mind warping, and put it in the oven (on the bottom rack) with the bread (on the rack next one up from the bottom one), you will get steam in your oven which I find helps eliminate the weird hard top gluten free crusts can get sometimes. *For an egg free version: Mix 2 Tablespoon ground flax seed, golden or dark varities, with 6 Tablespoons warm water. Let this sit for a couple of minutes, stir again, then add to recipe when the eggs are called for. Due to not needing to worry about the variables in egg size (lucky you!) 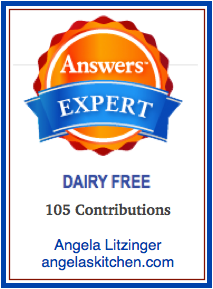 you should be able to use the entire cup of milk substitute. It isn’t Christmas, so why am I posting this now? Well, this year my oven was kaput for several weeks, so no bread for us. 🙁 A reader asked if I could post it, so with my oven finally fixed, here you go, Nina! I hope you enjoy it as much as we do! What a heartfelt post!!! Looks like it would be a great bread for Easter too! It is really delicious with left over ham, so, yes, it is great for Easter dinner and for the next day's leftovers. Yum! I am glad you stopped by! Let me know if you have any questions with the recipe. I find this nice "rye" for those that may not care for the more traditional style with caraway seeds. I hope you enjoy it! I am so glad you are here! I will be posting a more traditional style rye bread in the next couple of weeks. I have a craving for a reuben sandwich with all the corned beef on sale! Mmmm-mmm! I tried your recipe for rye bread and it turned out wonderfully. Thank you. This recipe does not contain rye. It is modeled after a rye bread to taste like the original recipe. Hope that clears up the confusion!